Sometimes you may find yourselves in situations where you cannot determine the outcome. It is during times of uncertainty that you can rest assured that God knows the outcome and He controls the situation. Sometimes you pray and ask God for something, but you receive something totally different and you can’t understand the reason. 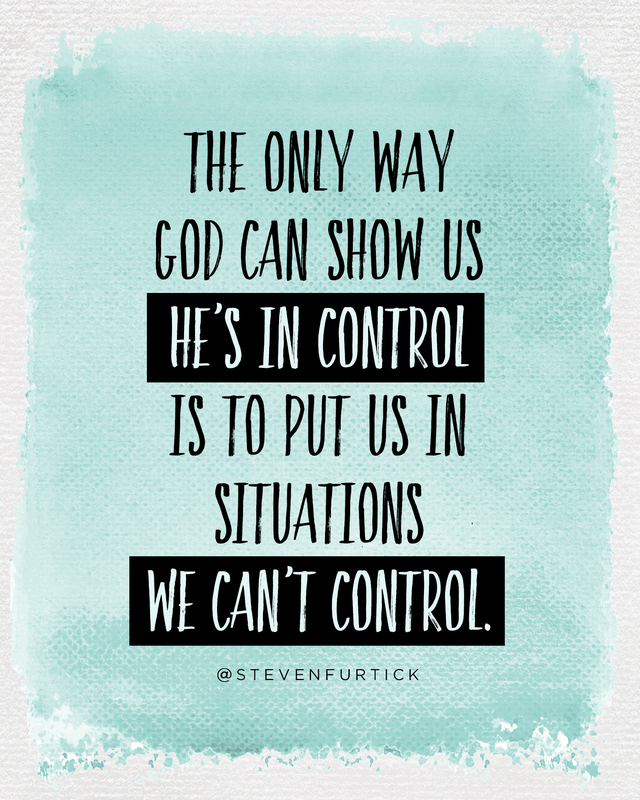 I encourage you this morning to rest in the fact that God is in control. Sometimes bad things happen to the faithful and righteous, and seeds of doubt begin to take root. Have you ever reached this low point in your life? I have been there and I am there right now, but like the psalmist, I will reflect on the years when the right hand of the Lord strengthened and upheld me. I will remember the works of theLord. Surely, I will remember His wonders of old. I will also meditate on all the works of the Lord (Psalms 77:10-13). I will enter the secret place of the Highest God where I can rest in His presence. This post is in perfect timing. I woke up at 2:16 am with the need to pray for my son, Tim, who received the Lord, but still had issues, deep issues that something triggers depression and he falls back into drugs. Fell hard last yr and is living on streets. Breaks my heart. My brother, Ken, who is not saved and God is dealing with him now. He is going through some heavy financial issues and is about to be evicted with nowhere to go and no money. He is a subcontractor but has not had enough big paying jobs to pay his bills. So, this post was a blessing, God telling me, He has this! I have had a similar experience with a loved one: addiction, homelessness, depression, but they also abandoned their faith in Christ. It forced me to trust God; to seek him and trust him. Many are the nights I am awaked at 3 a.m. and pray for them. I pray you will feel the peace of Christ envelope you; may you be protected from the attacks of the devil and discouragement. May you feel living water wash over you — feel it restore and refresh your soul. Thank you for sharing. We will continue to pray for each other because we believe that He that is within us is much more mighty and powerful than the evil spirits of this world. Have a blessed day. Hi Sandra. Thank you for sharing. I will bear you and your son and also your brother in my prayers. In the mighty name of Jesus I pray against the spirit of rejection that is attacking your son. We release the love and acceptance of the Lord Jesus Christ over his life. I pray that God will open another door of opportunity for your brother because we believe that when one door close another will open. In Jesus name, Amen. Continue to pray against that spirit of rejection because it doesn’t give up easily. I wrote this post because my son just lost his job and that foul spirit of rejection attack to bring on depression. But, we believe that God will prevail. Have a blessed day. Yes, rest in his presence in times of uncertainty. So true. That is the only place that you can hav peace of mind. Praying with you in your season. Amen! It is the best place to leave everything. Oh yes it is. Thank you. Oh do I know that feeling, while the dust from my pit still settles around my shadow. But what I’ve learned through those dry and difficult moments is that God has a purpose for our pain and for the pit. I understand David’s plight, but I’ve come to understand that God has a greater plan. Love ya Sis! Keep plowing and pressing! Thank you so much my brother in the Lord for those sweet words of encouragements. I am blessed that I have so much caring friend even though we are miles apart. God indeed has a purpose for our pain and dissappointments. It is hard to bear but it becomes easy when we have friends susch as you to encourage us. Have a blessed day. God is ABSOLUTELY AMAZING!! Blessings Sis! Praying for you. I have been there and am now towards the end of not knowing where God is taking me through all the trials I lived through. God is amazing! Thank you for your prayers. God is truely amazing. Have a blessed weekend.